Where’s Waldo? In Lake Placid celebrating his 25th birthday. Don’t bother looking for Waldo anywhere else but Lake Placid for the rest of July. 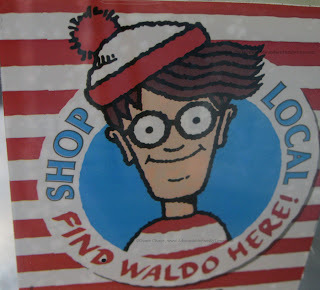 He has taken over 20 businesses in celebration of the 55 million Waldo books in print. The Bookstore Plus was one of only 250 independent bookstores across the country that teamed with Candlewick Press to celebrate the popular “seek and find” books. We have been searching for Waldo up and down Main Street, Lake Placid for a few days. My daughter walks into one store and easily spots the 6” cardboard cutout of the familiar cartoon dressed in red and white stripes. Some shops hide the time-traveling, world-traveling children’s book character in plain site while other businesses make the search more of a family challenge. There is a Waldo sticker on the front of all participating businesses and a checklist available from The Bookstore Plus. The rules are simple. Collect eight different “I found Waldo” cards from the businesses and take the cards to The Bookstore Plus and receive a free Waldo button. (For the first 100 children.) If 16 “I found Waldo” cards are collected from the local shops then the child will be entered to win a compete collection of Waldo books. On July 31 from 5–6 pm. The Bookstore Plus invites everyone to celebrate Waldo with look-alike costume contests, raffles, prizes and games. My children have joined forces to search for Waldo and have 15 cards to date. Waldo has always been a bit tricky to find, but they have a few weeks to continue the search. Other fun book-related activities planned focus on the popular Ranger’s Apprentice series by John Flanagan. There are weekly events on Wednesday evenings (5-6 pm) and Saturday mornings (10-11 am) that allow kids to earn their “oak leaf” by participating in all five events. Activities target stealth training, making a shield and outdoor safety skills. Children should be prepared to go outside. Call The Bookstore Plus 518-523-2950 for more events and activities. 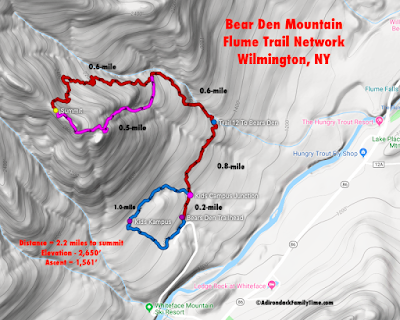 © Diane Chase, author of the Adirondack Family Activities™ guidebook series Adirondack Family Time available online or bookstores/museums/sporting good stores.